Imagine food that is so locally grown, it can literally be picked and placed on store shelves in just a few minutes. The new Whole Foods going up in Brooklyn will be doing just that. 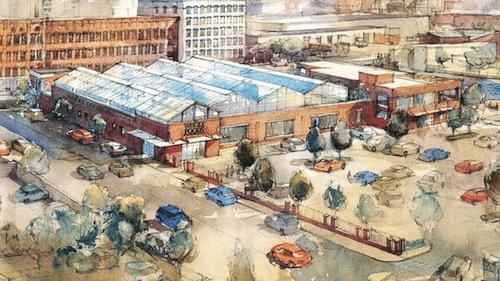 The grocery store chain announced it will be building a massive 20,000-square-foot greenhouse on the roof of the store, providing pesticide-free produce that is as locally grown as it can possibly get. The space will be maintained through an innovative hydroponic system. The store will partner with Gotham Greens for the project, a Brooklyn-based urban farming company. This will be the first commercial-scale greenhouse farm integrated with a retail establishment in the United States. Gotham Green is actually paying to build the greenhouse, too. All the store has to do is buy the produce as they would from any other supplier, and if the garden produces more produce than Whole Foods can handle, Gotham Greens will start selling it to other clients. If this works out, it’s likely that Whole Foods will begin implementing rooftop greenhouses in other stores as well. In terms of sustainability and economics, it can’t get better than this. It will provide local jobs and possibly even cut down on the price of produce, and customers can feel good about the fact that their food didn’t require a single gallon of fuel to be transported to the store. Do you shop at Whole Foods? Would this make you more likely to shop there if it was implemented in your town?